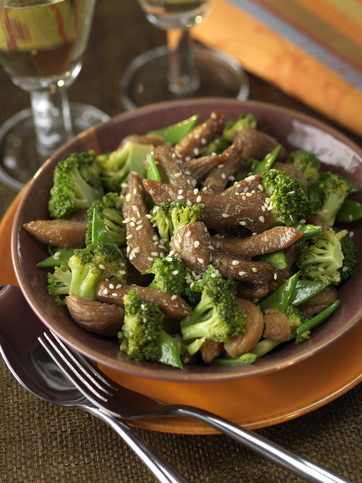 Classic Asian flavors make a perfect foil for pork and broccoli. Serve this easy stir-fry with hot rice or rice noodles. 1. Combine sauce ingredients in a bowl and set aside. 2. Heat a very large skillet over high flame for 2-3 minutes. Add 1 tablespoon peanut oil and swirl pan to coat the bottom. 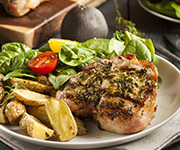 Add pork slices, season with salt and pepper and stir-fry until meat is browned, 3-4 minutes. Remove pork to a bowl. 3. Heat remaining 2 tablespoons peanut oil in skillet. Add broccoli; stir-fry over high heat, 3-4 minutes. Add peas; continue to stir-fry another 2-3 minutes. Lower heat to medium, add shallots, garlic and ginger, and stir-fry until vegetables are crisp-tender. 4. Stir in sauce, reserved meat, hot pepper sauce to taste and 1/4 cup water; bring to simmer and cook briefly, stirring, until vegetables are coated and everything is bubbly-hot. Serve immediately, sprinkling each bowlful with sesame seeds.